Competed at L2 dressage level. Which is the highest she is allowed for her age at the moment. Ready for the (Dutch) M2 level (shoulder in/walk pirouette/counter galop). 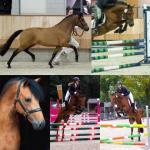 Competed in the B showjumping classes and made ready for the L level at the moment (90 cm). Has been clear every round (will never stop). This pony is very well trained and behaving. Although she is still young, she is easy to ride, very willing to work and has a positive attitude towards people and other horses. This pony is definitely a pony that will reach the highest dressage (FEI) and showjumping level and has a fabulous future ahead in the sport. 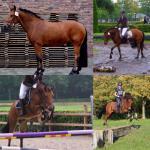 Competed at M1 dressage level and L showjumping but can easily do more. Jumps very easily and has a lot of power in his jumps. Experience in hacking out and cross (eventing). 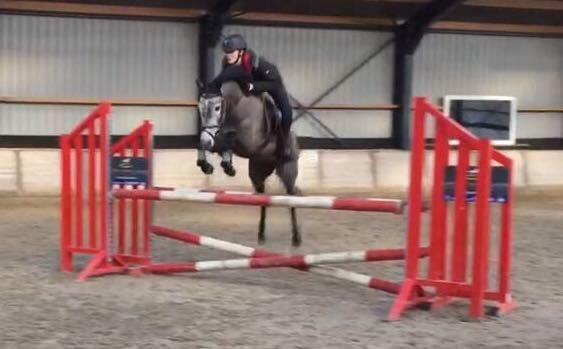 Has a beautiful showjumping technique and will therefor also be suitable as a hunter. Has jumped over our fences into the fields which is 1.30 meter high. Xrays available and 100% okay. Was a licensed stallion until the age of 4 and has some offspring. Now the perfect gelding. Healthy pony’s, vetted in 2017 and 100% correct. Both are taken to lessons every week and have experience in hacking out. No (stable) defects or unwanted behavior. Both ponies can be ridden by experienced but also less experienced riders. Based in the North of Holland.